WCHG’s Real Food team will take part in Manchester Science Festival this October (18th to 28th) as part of activities taking place across Greater Manchester. The festival is organised by the Manchester Science and Industry Museum and as part of it Real Food will be holding workshops at the Geodome and the Horticultural Centre Glasshouse in Wythenshawe Park. 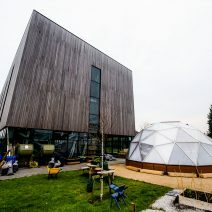 The Geodome is Real Food’s living classroom and located at The Manchester College, Brownley Road Campus. Participants will be taken through the nutrient journey and see a working aquaponics setup, learning about how fish, worms and plants work together and bringing aquaponics alive. The Horticultural Centre is located at Wythenshawe Park and here participants will be shown how to clone onions and leeks. The session will explain the processes and techniques necessary to producing perfect cloned vegetables and will also give the opportunity to practice some of these techniques and plant their own miniature ‘cloned’ vegetables to take home with them.